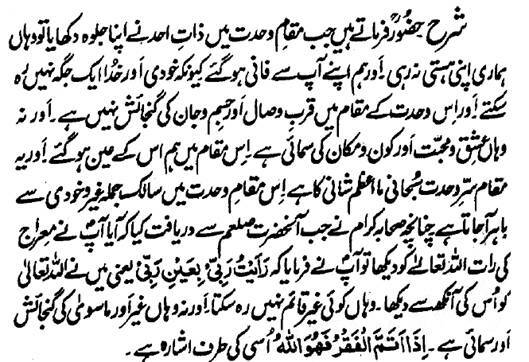 Hazrat Sultan Bahu Rahmatu-Allahe Ta-aala Alaihe says that: when the Essence of the Ahad revealed its beauty at the Station of Wahdat, my 'self' destroyed there and I lost myself because Self-conceit and God cannot exist at the same place and there is no room for the Qurb and Wisaal and the Body and Soul at this Station of Wahdat nor is any accommodation for the Ishq, Muhabbat and Time and Space. At this Station, I have become His Essence and this Station is of the 'Sirr e Wahdat Subhaani Ma Azam Shaani' (the Secret of My Wahdat is Pure and My Splendor is Great) . Saalik comes of the shell of all outsiders and self-conceit at this Station. Hence, the Holy Companions Radhi-ya-Allahu Ta-aala Anhum asked the Holy Prophet of Allah Hazrat Muhammad Sal Allahu Alaihe Wa Aa-lehee Wa-sallam that 'O Hazrat Sal Allahu Alaihe Wa Aa-lehee Wa-sallam ! What did you see on the Night of the Holy Ascension?' he graciously replied that 'I saw Allah Almighty through His eye' . No Outsider can survive there nor is there any room or possibility for an Outsider and the Outcast there. 'Faqar, when reaches its entirety (and perfection), that is Allah' [that is, it attains the Station of Rabubiyat and essence unites with the Essence] , it is a hint towards the same situtation.